boblob wrote: The Sola Sound OC84 reissue that I have has 15nF caps in place of the 10s to compensate for drift. That's pretty important - sounds much more like a vintage unit if you do that (more mids, a little smoother up top, and just generally better). Up to 22nF on the output cap still sounds good with the Tungsrams. I don't think that Dave uses the 15nFs to compensate for anything. Many vintage units had 15nFs, his own Vox included. He likes that sound a lot! Ah yeah. Cool. Gotta love Wifey. Mine had 10nF and all the schematics I'd seen had 10s, so I assumed wrong. A-B-ing with a set on Tungsram AC125s on the breadboard, 15nF got me much closer to the sound of the original. I had assumed drift/wide tolerance to be the reason (although differences in the way the transistors clip will come into it too). Right, different transistors do sound slightly different. My Valvo AC125s sound quite a bit brighter than my Philips OC75s. Your Philips AC125s should work great for a MKII, btw. Make sure you use the OC75 variant of the schematic with 10k on Q1's base and 47k on Q2's collector. 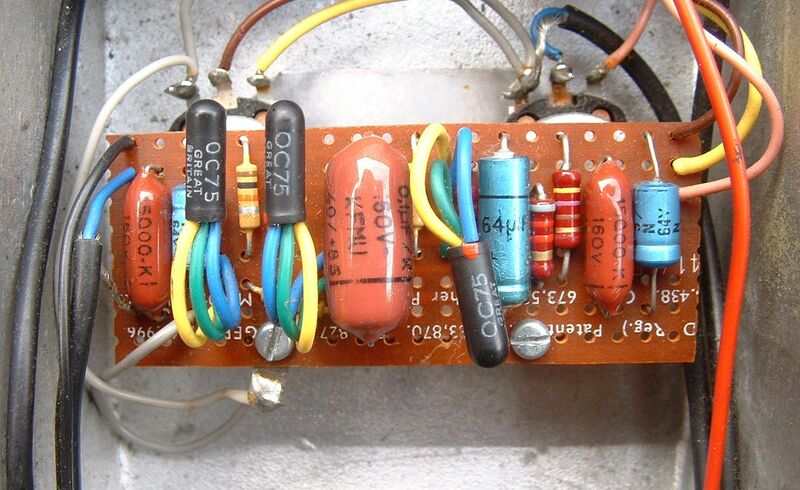 I built mine a few months ago, the trannies I used were from a smallbear kit oc75, I use some carbon comp resistor and a mustard cap, it sound great, but I got some of issues. first; the 470ohm resistor used to control volume I had to rise it value, but I had to rise alot y mean on my built is 33K and it gives me a good range of volume to play with. second: the attack pot doesn't make much difference at max or min. third: whan I set a Micro POG before it the sound turns weak, duno maybe a impedance problem. forth: the pedal is a little trebly, is there something i could mod to get more bass or les treble??. so can any of you guys tell me how to fix the last three issues? Did you use the schematic that came with the transistors? That tends to cause most of your issues. Small Bear biases Q3 at 4.5V, which makes it sound trebly and brings down the level. They use a 100k at Q1's base which takes a lot of range from the attack pot when used with OC75s. Impedance problems with pedals/buffers in front of a MKII are quite common..
yes I did, I followed their scheme, so what bias value you recomend? something higher or lower?. on the base of Q1 I've got 10K, but the attack pot is connected to Q2 and it base has a 100k. anyway I will make some probes. Where did you get that hot enclosure? rosetta wrote: yes I did, I followed their scheme, so what bias value you recomend? something higher or lower?. With stock values and OC75s it usually ends up somewhere between 7.5 and 9V. I can see an 8k2 resistor. If that's Q3's collector resistor things should be alright. With that board you probably followed a later Supa Fuzz schematic. It's pretty much identical to the Sola Sound made version except for the 10µF electrolytics. they used to sale them on pedalenclousure.com, but the webpage doesn't work. yeap I followed a supafuzz schematic with the smalbear changes. Cheers. So they are basically unavailable as of now! Shame, shame, shameee. Try it without any changes then. You may have to adjust Q2's collector resistor to bias it to the sweet spot between noisyness and gating, though. If it's a steel "Z wedge" enclosure, I have an unfinished one, undrilled (and unmarked apart from a couple of tiny tentative drill marks that would disappear under a finish). I bought without realising I didn't have the cojones (or drill bits) to drill steel, and you or anyone else is welcome to it for £10 + the cost of postage to wherever you are. bajaman wrote: Of all the tonebenders, I really do like the MkII version - It nails the Hendrix Voodoo Child sound when you put a well tuned wah pedal in front of it too. There it is... Marshall Super Fuzz justification to add to my pedal collection. Nice! That will save me time finding the mojo parts... Thanks! jalmonsalmon wrote: There it is... Marshall Super Fuzz justification to add to my pedal collection. Follow you, follow me: i bought those very same dsi oc81d that you have like one year ago, never got around to make the build, the other day i fired the pro mk ii thread you posted, and right now i am building a mk ii with those dsi's into a WHITE PIgeon FX MK I enclosure. Good grief. The vox tone bender vid that Electric Warrior has posted..